This awesome house was built in 2000 and renovated in 2010. The garden is very well kept and offers plenty of space for sunbathing or a family picnic. The chlorine pool of 12m x 6.5m and a depth of between 0.65m and 2.10m is surrounded by a terrace with hammocks, a dining area and a barbecue. The outdoor jacuzzi together with the sauna is ideal for your moments of relax. For those who do not want to give up the sport during their holidays, there is also a small gym. An outdoor shower is great for refreshing. Everyone will have fun with the ping pong table. Different terraces, distributed on the ground floor and upper floors are perfect for a glamorous glass of vine in the afternoon. This finca is fenced and there are no direct neighbours. 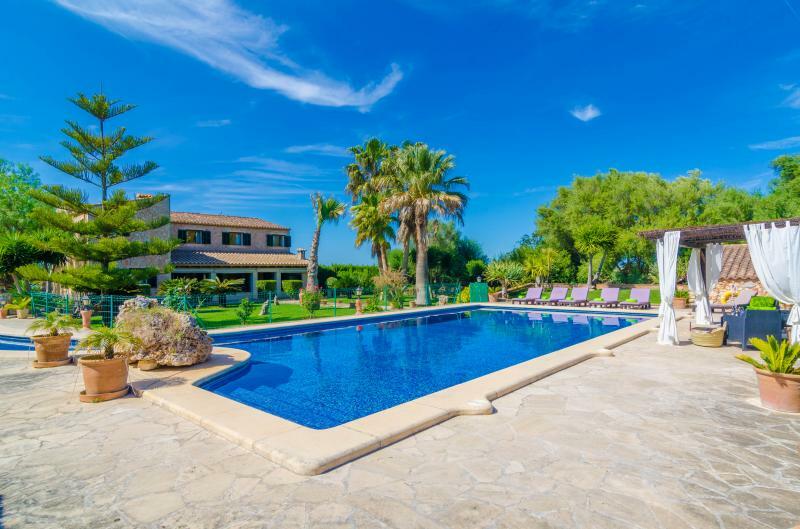 This stunning finca has plenty of space for groups and large families since it has 2 buildings: the main house and the annex. In the main house you'll be met by a bright living room with fireplace and another lounge on the ground floor that invites you to have a rest while watching a movie on satellite TV or reading a good book. The nice kitchen with dining area is fully equipped, and includes a ceramic hob. Upstairs there are two bedrooms with two single beds, wardrobe and access to a terrace each, one of them with bathroom en suite. There is another bathroom with jetted bathtub and a toilet downstairs. The independent laundry room offers a washer, dryer, iron and ironing board. The annex has 4 bedrooms on the ground floor and two more upstairs, all of them with an en-suite bathroom with jetted tub. The extra guests will sleep in single sofa beds located in one of these bedrooms. All bedrooms offer twin beds, AC, closet and exit to different terraces. We can provide up to 2 baby cots and 3 high chairs for your babies. The living rooms are equipped with AC and the whole accommodation is features oil central heating for the winter season. 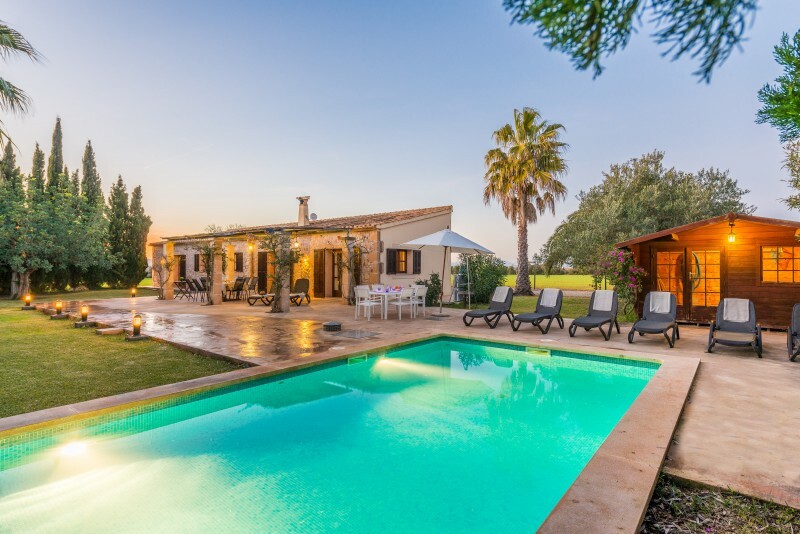 The property is located in the south-east of Mallorca, near Felanitx and surrounded by nature and tranquility. 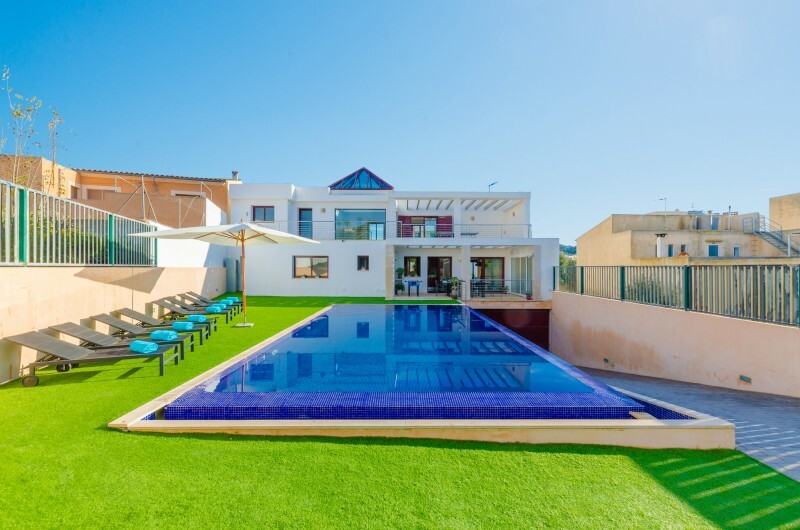 The authentic village of Felantix is a few minutes drive away and you will find there all the necessary services for an independent stay, such as restaurants, supermarkets and shops. The Felanitx flea market, where you can buy fresh food from the island, takes place every Sunday. The Sanctuary of San Salvador is a beautiful destination for cycling or driving trip. The beach, Cales de Mallorca, is 14.5km away but the coast offers many more beautiful coves to explore such as Cala Magrana, Cala Mondragó and Cala Marsal. The famous natural beach of Es Trenc is about half an hour by car. For additional costs contact the advertiser. Holding events is not allowed. There is outdoor parking for 5 cars.